From the article: “I did not call myself a feminist until I was nearly 20 years old. My world had taught me that feminists were ugly and ridiculous, and I did not want to be ugly and ridiculous. I wanted to be cool and desired by men, because even as a teenager I knew implicitly that pandering for male approval was a woman’s most effective currency. It was my best shot at success, or at least safety, and I wasn’t sophisticated enough to see that success and safety, bestowed conditionally, aren’t success and safety at all. They are domestication and implied violence. From the article: “Modest fashion might come across as a humblebrag: You have to be a pretty stylish, pretty good-looking woman to claim ownership of such radical dowdiness. (The style seems especially popular among women in their 20s and 30s — trumping the received wisdom that one should flaunt one’s body before it is marked by the supposed scourges of childbearing or menopause.) It can also sometimes seem like an elitist project of sociocultural self-positioning: By embracing the covered-up look, you declare yourself part of a particular psychographic tribe, one whose members don’t just dress for other women, but for a particular subset of other women — those who get it, who are sophisticated enough to understand that opting out of conventional beauty standards makes for its own kind of conceptual, better-than-thou fashion. It also, however, has the feel of a real dare. The image is used under a creative commons license with thanks to Jill Bazeley on Flickr. It is a photograph of a beach scene, taken at sunset. 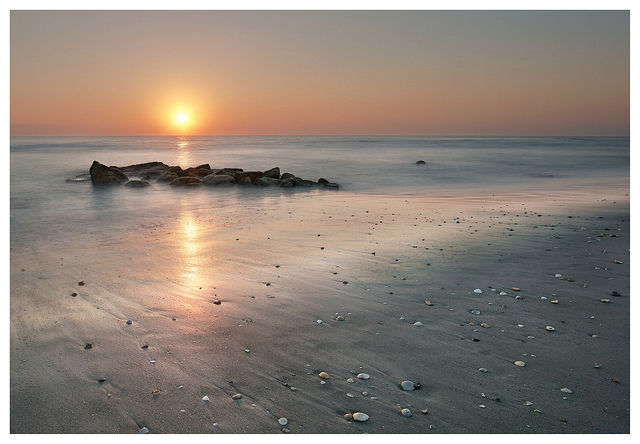 The sun is hanging low in the sky and casting a yellowish-orange glow over the wet sand and rocks.